* ‘time and tide’ will be screened in competition at DocAviv 2019. * ‘Wadland’ will be screened on the 18th of April as one of the winnners of Indie Cork at the North West Film Forum, Seattle. * An oeuvre-night of all films by Marleen van der Werf is on at the 12th of April @ Filmhuis Schoorl. * Both ‘time and tide’ and ‘Maalstroom‘ are shortlisted for the DIRECTORSNL AWARD! * Proud to present: ‘time and tide’ will have the international premiere at the Thessaloniki Documentary Festival 2019. * The documentary ‘Maalstroom’ will be broadcasted on the 12th of December 2018 at 23:03 NPO2. For this film Marleen van der Werf assisted director Misja Pekel again. * At Zeelab #4, organised by the Satelietgroep, Marleen presents some work in progress and discusses how collaborations of arts and science can enhance public awareness. * ‘time and tide’ (‘tijd en tij’) is nominated for a ‘Gouden Kalf’ op het Nederlands Film Festival 2018, where the film will also have a national premiere! * The 69 seconds 16mm film ‘Exposed’ by Marleen van der Werf premiered at the Back to the Future Film Festival by Filmwerkplaats in Rotterdam and was part of the program of Internationale Kurzfilmtage Oberhausen 2018. * For the documentary ‘Maelstrom’ (‘Maalstroom’) Marleen van der Werf assists director Misja Pekel. ‘Maelstrom‘ is a poetic found footage film portraying the memories carried by the refugees in Calais and Duinkerke. The film will premiere in 2018. * The performance ‘Zee van Zand’ (‘Sea of Sand’) premiered at the Oerol Festival 2017. ‘Zee van Zand’ is a musical and visual improvisation in a dune lanscape at night. Water, light, words and wind help to shape the cinematic impressions that rise from the sand. Briefly reflecting the immensity of the landscape, only to disappear under the sand again. * In 2017 ‘Once Upon a Tree‘ will be screened again! This year at the Salt Lake City Film Society, F.A.V.E. Academy in Decatur, Georgia and the KinderDocs in Greece. * Another award for ‘Once Upon a Tree‘! This time at the Srem Film Fest. * ‘Once Upon a Tree‘ will be screened worldwide by ‘Screm Film Fest‘, and will also be screened at the SE Asia Film Festival and at ‘Oki Doki’ in Poland. 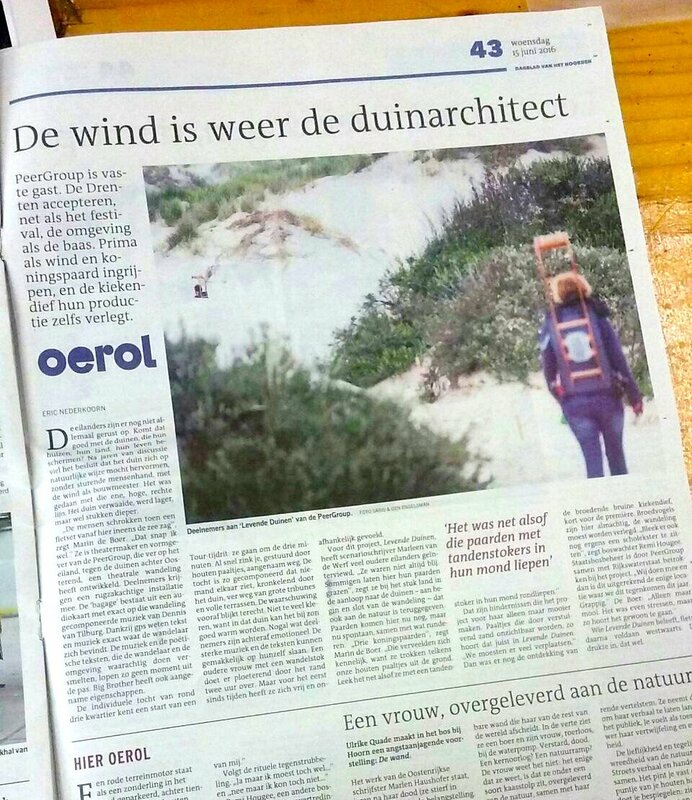 * ‘Levende Duinen (‘Living Dunes’) had a wonderful première at the Oerol theater festival and had a review by the Dutch newspaper NRC in which the experience we created is mentioned as best of the fest: NRC 13 juni – Duin Poëzie op Oerol. * Seattle Children’s Hospital is now showing ‘Once Upon a Tree’ on their ‘Get Well Network’. * ‘Levende Duinen’ (‘Living Dunes’) is a multidisciplinary theater project for which Marleen van der Werf collaborates with the PeerGroup. The project ‘Levende Duinen’ will result in performances at the Oerol Theater Festival in June 2016 and 2017. * ‘Once Upon a Tree’ will be screened at the 2016 CMS International Children’s Film Festival in Lucknow, India. * Two new film projects by Marleen van der Werf will go into production in 2016: ‘Paal’ and ‘Wild’. * 2016 screenings of ‘Once Upon a Tree’ at Children’s Film Festival Seattle 2016, Bellingham Children’s Film Festival, Washington for the Spokane Children’s Film Festival, The Henry Art Gallery in Seattle, Coastline Children’s Film Festival Benton Harbor, Monterey Art & Film Festival for the Youth, Monterey, California, Clay-Platte Montessori Children’s Film Festival, St. Louis, Missouri, screenings in the The Rose Theatre in Port Townsend, at the RINCON International Film Festival, Rincon, Puerto Ric, Scottsdale International Film Festival and the ZOOM FAMILY FILM FESTIVAL at the Wexner Center, Columbus, Ohio. * ‘Once Upon a Tree‘ won the award for Best Documentary at the Sharjah International Children’s Film Festival. * Both ‘Wadland’ and ‘Once Upon a Tree‘ are selected for the Wildlife Film Festival Rotterdam 29 October – 1 November 2015! * Marleen van der Werf is a member of the jury for the Planet in Focus Film Festival 2015. * ‘Zentuin in de Zuidas’ will be screened on the 3rd of October 2015 at the Buddhist Film Festival Europe 2015 in the EYE Institute Amsterdam. * A new film project ‘Paal’ is in development in the Teledoc Campus program by the Dutch Film Fund, Mediafonds, CoBo Fonds and the Dutch broadcaster EO. * ‘Once Upon a Tree’ is selected for the Sharjah International Children’s Film Festival 2015. * ‘Once Upon a Tree won at the Short Shorts Film Festival Asia in Tokyo! * ‘Once Upon a Tree’ in competition at Short Shorts Film Festival Asia and screenings of the film all around Canada on Earth Day. * Great news! ‘Once Upon a Tree’ became second at SXSW 2015 in the Films For the Forest challenge! * ‘Once Upon a Tree’ is screening at the Against Gravity Film Festival. *’Zentuin in de Zuidas: De stilte voorbij’ will be broadcasted the 19th of April 2015 at NPO2. *Another award for ‘Once Upon a Tree’, this time at the Chennai International Short Film Festival! * Project ‘Mei’ received funding from the Dutch Foundation for Literature! * More screenings of ‘Once Upon a Tree‘ in competition coming up: BOGOSHORTS in Bogota, Olympia International Film Festival for Children and Young People in Athens and The International Short Film Festival ZUBROFFKA in Poland. * Wadland will be screened at the CYCLOP 4th International Videopoetry Festival, Ukraine. *Once upon a Tree” is selected “Best Documentary Film Editing Award” at GZDOC 2014 China. *’Once Upon a Tree’ is selected as part of the Documentary Short Subject competition of the Camerimage Film Festival which is an ACADEMY AWARD® qualifying festival for this category. * ‘Once Upon a Tree‘ will be screened at the Uppsala International Short Film Festival in Sweden. * ‘Once Upon a Tree’ is part of the official selection of the 13th Santa Cruz Film Festival. And Doxs! Duisburger Filmwoche. * ‘Once Upon a Tree’ has won at Wildlife Vaasa Film Festival in the category ‘Children Films’! *’Once Upon a Tree’ is selected for the International Short Film Festival Courts Devant in Paris and the Lahore International Children’s Film Festival in Pakistan. As well as the Planet in Focus Film Festival in Toronto and the 28th Braunschweig International Film Festival in Germany. 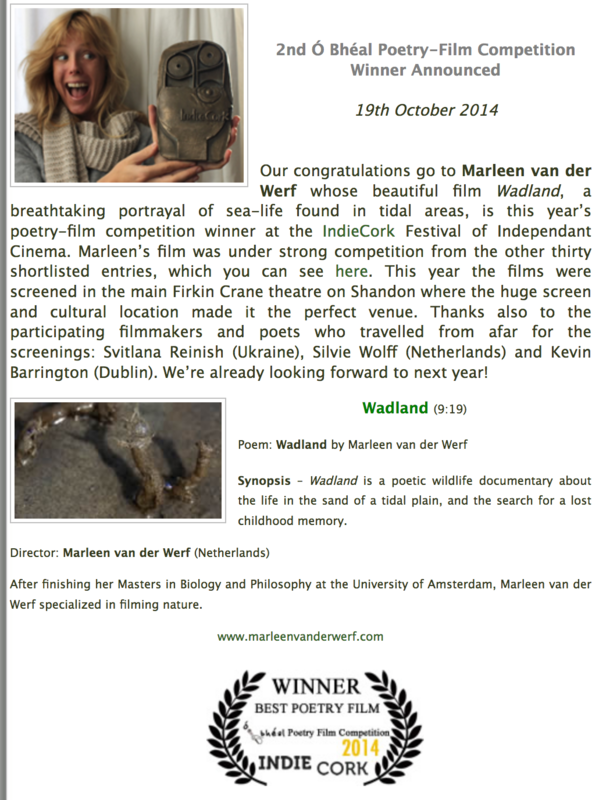 * ‘Wadland’ is shortlisted for the IndieCork Film Festival October 12-19! * ‘Once Upon a Tree’ will have it’s North American première ate the Hamptons Film Festival where it will be competing for the ‘Golden Starfish Award’. On the same continent, the film is also in competition at the Hot Spring Documentary Film Festival. * October 14-19, Once Upon a Tree will take part in the international competition at the 31st Tehran Short Film Festival in Iran and will be part of the CineDOC-Tbilisi in Georgia. * ‘Once Upon a Tree’ is a finalist in the International Short Competition of the CineEco in Portugal and the competition for Best Children Film at the Wildlife Vaasa Film Festival in Finland 1-5 October 2014! *Proud to present that ‘Once Upon a Tree‘ is part of the Environmental Film Festival in Melbourne! *In August ‘Once Upon a Tree’ is in competition at the Seoul International Youth Film Festival and closing film at the Busan International Kids’ Film Festival. *More screenings of ‘Once Upon a Tree’ coming up at film festivals in South Korea, and premières at film festivals in France, Australia and North America! *‘Once Upon a Tree’ is a finalist in the competition for ‘Best Short Documentary’ at the Shanghai International Film Festival 2014! *In July ‘Once Upon a Tree’ and ‘Wadland’ are screened at the Clivia Festival in Amsterdam. *‘Once Upon a Tree’ is a finalist in the competition for ‘Best Documentary’ at the Porto7 Short Film Festival 2014. *‘Once Upon a Tree’ is part of the official selection of the Environmentel Film Festival in Seoul, South Korea and the Festroia Film Festival Setubal. There are also sneak previews of the film as part of the Summer series of CoolConnections in Moskow and the Rooftop Film Festival in New York. *‘Once Upon a Tree’ is a finalist in the competition for ‘Best Documentary’ and ‘Best Short’ at the Kingbonn Film Festival in China! *’Prosecutor’ (Officier van Justitie) – directed by Misja Pekel – premières on the 16th of May. Misja followed a prosecutor in her work from the crime scene untill court. Marleen van der Werf was the assistent director for this project and provided some of the camerawork as well as soundrecording. The documentary will be broadcasted the 19th of May, 20:50 at NPO2 and is suported by broadcaster HUMAN and Mediafonds. *’Once Upon a Tree’ will have it’s international première in May! *’Wadland’ will be in competition at the ‘ReVersed Poetry Film Festival’ in Amsterdam. On the 6th of April 2014, at 17:00 in Kriterion.